Clear your calendar - It's going down! Leadership Summit 2016 kicks off on August 5th, and you're invited to take part in the festivities. Microsoft (11 Times Square) is our meeting spot for a day of fun and excitement. Come one, come all, bring a guest, and hang loose. This is going to be epic! Make your travel plans now to attend the 5th annual STF Summit in New York City. Watch #STFSummit on Facebook Live! We're broadcasting our keynotes and panels. We want all of you to be part of the conversations. Follow us on facebook.com/shesthefirst so you don't miss a beat. 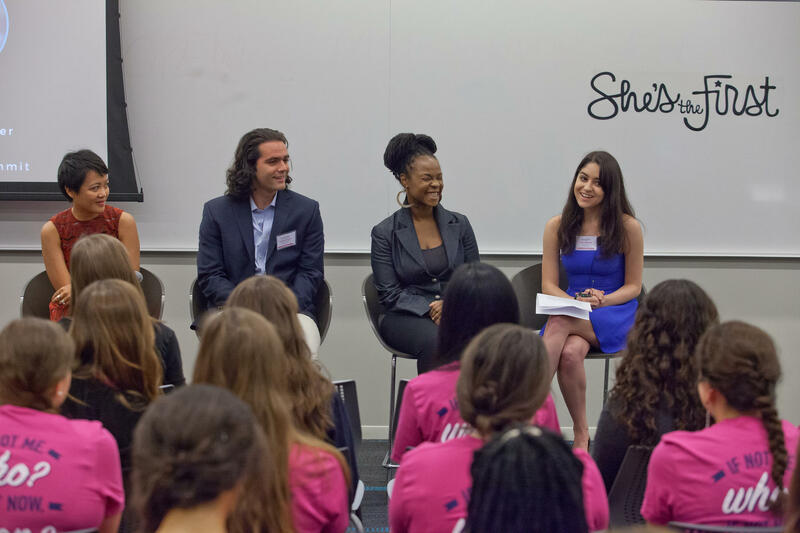 Register now for the 5th annual She's the First Campus Leadership Summit, hosted at Microsoft in New York City. The Leadership Summit is a life-changing weekend extravaganza, exclusively for active She's the First Campus Chapter Members and Alumni. Meet fellow campus leaders from across the country, network with innovative companies, and be inspired by rock star guest speakers. The main stage events and workshops of the STF Summit will be held at the Microsoft Technology Center at 11 Times Square (8th Avenue entrance). Tailor your experience or mix up your weekend with our 3-track schedule. Hone your personal leadership skills, explore career opportunities, learn how to motivate a team, and soak up life lessons from inspiring entrepreneurs, activists, and innovators. Take a deep dive into girls' education issues around the globe with speakers and workshops focused on international development, feminism, politics, and everything in between. Learn to command attention and make your voice heard through discussions on effective advocacy, rallying support online, event planning, storytelling, and building partnerships. 5:00-7:00p Free Time - Explore NYC! Editorial Director of Audience Strategy, Time Inc.
She's the First is an award-winning nonprofit organization that provides scholarships to girls in low-income countries who will be the first in their families to finish high school. Members of 193 high school and college Campus Chapters participate in our year-round programs to achieve this mission. The Leadership Summit will be hosted in Manhattan, which is easily accessible from NYC's three major airports (Laguardia, John F. Kennedy, and Newark), via train to Penn Station or Grand Central Terminal, or via bus to the Port Authority Bus Terminal. Our main venue, Microsoft, is located in the 11 Times Square building on 8th Avenue between 41st and 42nd Streets. Reserve your room at the Fairfield Inn & Suites Penn Station, Fairfield Inn & Suites Downtown East, or Courtyard Marriott Fifth Avenue to secure a special rate for STF Summit guests. Register as an attendee to receive more information about booking your room! The following companies and organizations have helped make the 5th annual STF Summit a reality. This ticket grants current STF Campus student leaders admission to the 5th annual Leadership Summit sessions on Friday, 8/5 and Saturday, 8/6, as well as the Campus Achievement Awards ceremony. This ticket grants STF Campus college/university alumni leaders admission to the 5th annual Leadership Summit sessions on Saturday, 8/6 and Sunday, 8/7, as well as the evening reception events. Teachers, chaperones and guests should email summit@shesthefirst.org to confirm your guest ticket.